A small character study that doesn’t lead to anything as interesting as it should. 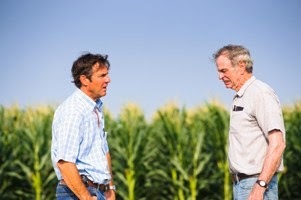 Dennis Quaid stars as Henry Whipple a determined business man failing in the farming business and Zac Efron as Dean Whipple who wants to be doing anything other than following in his father’s footsteps. He’s also the son who stayed who gets to watch his parents dote after the possible arrival of his older brother who went to find himself on a whirlwind adventure around the world. Dean is stuck in Iowa trying to find himself while being groomed for the family farm but wanting to race a car around a track in circles. Dean and Henry are both interesting characters, and the potential for a caustic relationship between Dean and older brother Grant gives the film an intriguing air. But actual intrigue would have been better than just an air of it. As a character study, it had the perfect set-up with both Quaid and Efron playing the troubled Whipple men with half-assed smiles on their faces and fear in their eyes. But At Any Price isn’t a character study; it’s a thriller. The mysterious score starts early on and keeps you guessing when something dark or sinister is going to occur. Sub-plots are introduced with Dean’s attention-starving girlfriend and Henry’s illegal activities. And while they do eventually lead to something interesting, they’re hardly interesting themselves and could have been tightened up significantly. Left to Right: Dennis Quaid (Henry) and Chelcie Ross (Byron). And then comes the thriller climax and the character study climax when father and son finally have something to connect with. But as the thriller climax, it just kind of happened with no additional build-up or intrigue and it made everything that came before it a little less interesting then it was before. It kept me invested the whole way through, but I was left wishing there was more to it. A decent movie about the flailing Whipple men just went out with a whimper. At Any Price is decent as a small indie film but it needed to be tightened up with more significance to the on-going events to be a good movie.